Headlining BenQ’s line of interactive flat panel displays is the new 4K RP750K. It is equipped with 20-point touch interactivity, digital touch recognition technology that converts handwriting to standard font, and two 16-watt speakers. The display utilizes a nanosilver coating to repel bacteria and reduce the spread of germs. It also features BenQ’s market-leading EyeCare technology suite to reduce blue light, prevent glare, and minimize flicker that can cause eye fatigue. The BenQ RP750K is packed with outstanding features that enhance collaboration, while integrating innovative technologies that provide a healthier experience. Available with DisplayNote, the RP750K enables collaborators to wirelessly stream and mirror digital content, offering a wide selection of integrated apps and games. For administrators, the BenQ Multiple Display Administrator software adds remote monitoring and control of all displays in addition to administering instant equipment performance and providing status alerts for IT staff. Boxlight has launched two new lines of standard and interactive projectors as well as the second release of its ProColor Series 1 interactive flat panel displays. The new P9 and Cambridge projector lines bring the latest technology in standard- and short-throw projected images and collaborative areas to the classroom. The four projectors in the budget-friendly Cambridge line are designed to replace schools’ outdated or failing projectors with ones that provide detailed and brilliant images. The two P9 interactive projectors allow up to five students to work together on an interactive lesson with an infrared pen. The four new ultra-high definition (UHD) ProColor flat panel displays provide 4K clarity so that onscreen content is easier to see, even in large classrooms. The displays’ Touch 360° interactivity features up to 20 single-touch points or 10 dual-touch for gestures. Each interactive display includes the MimioStudio classroom software and allows for complete integration with other Boxlight products, including the MimioMobile collaboration and assessment app. Casio America, Inc. announced recently that it has expanded its LampFree line of projectors with the introduction of the XJ-UT311WN Ultra Short Throw Projector. Ideal for displaying images at close range, the XJ-UT311WN can project shadow-free, crisp visuals, thanks to its built-in 0.28:1 fixed lens. The built-in short throw lens and advanced mirror system provides an extremely close throw ratio and projects an 80-inch image from just 1.5 feet away (up to 110-inch diagonal). The XJ-UT311WN produces 3,100 lumens of brightness and boasts WXGA (1280 x 800) resolution, producing up to 1.07 billion colors, with a 20,000:1 contrast ratio. In addition, the XJ-UT311WN is equipped with Casio’s Laser & LED Hybrid Light Engine that lasts for up to 20,000 hours. It combines a laser and LED light source to create a high-brightness, mercury-free tool that uses as little as half the amount of power per unit compared to other lamp-based projectors. Epson merges the color output of its 3LCD technology and the world’s first inorganic laser phosphor with inorganic 3LCD panels to create extremely bright and long lasting ultra short-throw laser projection displays specifically designed for the classroom. The new BrightLink 710Ui Interactive Laser Display offers a large, bright 100” image, 20,000 hours of virtually maintenance free operation, and instant ON/OFF--perfect for the type of large format viewing that takes place in classrooms. The display features a full array of connectivity options, including three HDMI ports. The BrightLink 710Ui also offers an optional wireless module and it supports enterprise-level network encryption. InFocus has recently announced the InFocus JTouch, a proven device for promoting student engagement and learning retention in elementary schools by creating a more engaging, connected, and collaborative classroom. It’s designed to be easy to use, with capacitive touch technology, which works like a smartphone with no need for a stylus or calibration. Its 4K-resolution screen lets educators and students experience more detailed content, draw on top of documents and Web-browse in real time. The InFocus JTouch brings future technologies to classrooms now, allowing teachers to take advantage of an intuitive touch screen experience, connectivity options, and 4K high resolution. It also has wireless collaboration that works with any Airplay, Windows, or Chrome device so students can share their own work for feedback or collaborate on a project together on the board. NEC Display Solutions of America recently announced release of the 65-inch E651-T display. The 10-point integrated infrared touch screen is a cost-conscious commercial-grade display targeting the K-12 education market. NEC Display built a solution that minimizes technology distractions, maximizes classroom time and learning, and reduces costs. The display’s anti-glare, tempered glass protects the display from damage and also reduces incidental fingerprinting and glare to preserve imagery on the screen. The display’s power consumption – just 140 watts – is extremely low considering the sizeable surface area of the fully commercial display. This helps lower the overall total cost of ownership for the customer. The display also has a built-in media player that can be prioritized so that the display can automatically switch to USB-loaded content via an external source when the touch screen is not in use. The Optoma ZW300USTi features state-of-the-art laser phosphor technology, combining a high-quality image with 20,000+ hours of virtually maintenance-free lifetime performance. 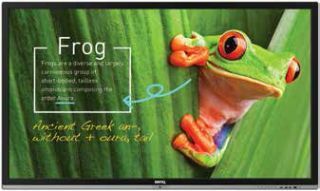 Ideal for any classroom setting or application, the ZW300USTi’s ultra-short throw ratio makes it extremely flexible, with the ability to display a 115-inch image from only 19 inches away. The projector features 3,200 lumens and a 100,000:1 contrast ratio with Dynamic Black enabled, and is equipped with a 10-watt speaker and a PC-free USB media player to support video, audio, image, and presentation files from any USB device. The Optoma ZW300USTi combines reliability and maintenance-free operation with flexibility and cutting-edge laser phosphor technology, making it the ideal choice for any classroom environment. Featuring next generation TouchBEAM interactive touch technology, compatible with both Windows and OS X, the ZW300USTi creates an immersive and collaborative experience, as multiple users can simultaneously engage with the presentation. Promethean World announced a new product, ActivPanel, a built-in digital whiteboard for free-form handwriting and drawing, with saving/sending capabilities and a simultaneous touch and pen surface where teachers can enable palm-erase or convert handwriting and equations into text. The externally accessible Android provides instant access to educational apps directly from the home screen, mirrors mobile devices to share content, and connects Bluetooth devices to support lessons. It also simplifies the device maintenance process and minimizes costs associated with display diagnostics and repairs. Included with ActivPanel is ClassFlow Desktop, lesson delivery software that enables teachers to easily build and present interactive lessons. ClassFlow Desktop comes with an easy-to-use interface, supports popular lesson file formats (i.e. Smart, Notebook, Adobe, PDF, and Flipcharts), and works both offline and online. ViewSonic has released the ViewBoard IFP7500, a 75-inch interactive flat panel with a 20-point touch screen for remarkable collaborative experiences. It delivers incredible collaborative capabilities with simultaneous touch capabilities and built-in ViewSonic vBoard software. The IFP7500 can be placed on a wall mount or on an optional trolley cart for flexible installation in any environment. The ViewBoard IFP7500 features optional dual slot-in PC capability with Open Pluggable Specification [OPS] and Intel’s Smart Display Module [SDM] for future-proof compatibility. With a built-in ARM quad-core processor and an Android 5.0 operating system, the IFP7500 offers 2 GB of memory and 16 GB of storage. It features multiple connectivity options to connect to a variety of computing and multimedia devices, as well as exclusive, pre-installed vBoard and vMeeting collaboration software and built-in casting functionality. NovoTouch, seamlessly connects users to one display. Integrating NovoConnect technologies with an interactive 4K display, NovoTouch is a simple-to-use wireless presentation and collaboration solution. The Ultra HD 4K interactive display, available in 65-inch, 75-inch, 86-inch and 98-inch, supports up to a 20-point finger touch capability. In addition, the NovoTouch creates a convenient way to share, compare and collaborate in various settings using one-click management. The meeting host software allows the presenter to connect up to 64 users wirelessly, display four presenters with one-click control, preview screens, moderate and more.